This project hits all the bases. Using recycled and very inexpensive materials? Check! Encouraging kids to create, decorate, and bedazzle to their heart’s content? Check! Motivating kids to write? Check! Strengthening family collaboration and communication? Check! Fun for kids aged 1-111? Check! Remember when the daily snail-mail occasionally included an actual letter, handwritten, from a loved one? Oh, the satisfaction of real stationery, a personal message, familiar handwriting! Delicious! Bring back the magic by building your own family post office. The project itself will absorb your family’s attention for an hour or two (perfect for a snow day! ), but once you’ve created the post office, you can use it for years. One empty cereal or cracker box per family member. These will become mailboxes. One larger cardboard box, which will become the post office (see image in opening paragraph). If your family is larger than four people, you’ll need a box with enough surface area to hold a cereal or cracker box for each family member. Paint, tape in various colors (duct, masking, and electrical tape work especially well! ), contact or wrapping paper to cover the cereal/cracker boxes. Decorating supplies: permanent markers, magazine clippings, yarn, glue, fabric scraps, beads, glitter, doo-dads — any cool stuff you have lying around. Paper, envelopes, markers, pens, rubber stamps, stickers, and other fun items for letter-writing. Cut the top flaps off the boxes. Decorate each cereal box. These will become the individual mailboxes. Make sure each family member’s box is labeled with his or her name. Hint: If you’d like to paint each box ahead of time to cover up the printing on the box, then children won’t have to wait through drying time to add their own artistic touches. Hot-glue each mailbox to one side of the larger box. Hint: Decorating the larger box is also fun! Load the inside of the large box with writing supplies. This is now your post office! Mail your letter, and wait for a reply! Younger children might like a set of cards with familiar words on them, so they can write letters\ on their own. 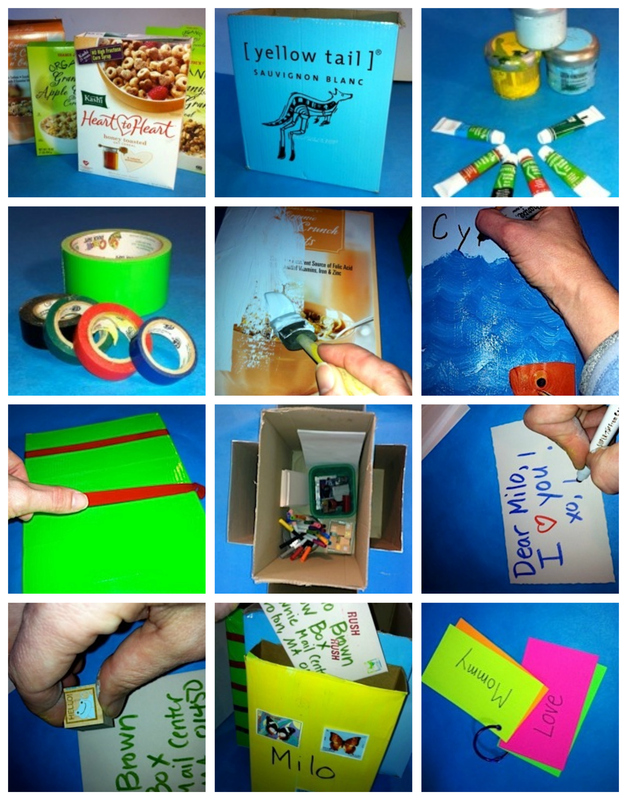 Write words on index cards, punch a hole in the corners, and connect with a binder ring. Ellen Olson-Brown is a teacher, author of four children’s books, aspiring yogi, Minervan, and enthusiastic consumer of art and office supplies. Positive psychology, mindfulness, and the science of human flourishing are her current fascinations, and she loves supportively daring people to amaze themselves. Ellen lives in Groton, Mass., with her husband and twin sons. ::: This piece is reprinted from the most recent issue of the Creative Times — subscribe and join the fun!